I bought a second generation Apple TV back in October/November and I realized I never got around to posting a review. Here are my impressions after owning the device for a few months. Overall I really like it. When I moved back in October I finally made the switch to HDTV and it's great to be able to watch HD video podcasts on my 42" HDTV. I was disappointed that the Apple TV uses home media sharing to access iTunes libraries so it won't work with my forked-daapd media server. If I want to watch or listen to my iTunes library on my Apple TV I have to turn on my desktop computer which is really inconvenient. As a result I haven't been using the Apple TV as much as I might like until recently. What's changed is the ability to stream YouTube and other video content to the device from my iPhone with the latest iOS releases. If I want to listen to music, I can use the Apple Remote application on my iPhone to access my music library shared over forked-daapd and then set the output from the Linux server to be the Apple TV AirPlay speakers. I also recently realized that the Apple TV Internet section includes a list of podcasts including most of the ones I watch (provided by TWiT and ThisWeekIn). That's good on two fronts because I can stop subscribing to them in iTunes and avoid wasting disk space by streaming them and also because I don't have to turn my computer on to be able to watch them. I was having a problem with the device where it would not wake up when sleeping and I would have to pull the power plug and reboot it most of the time when I wanted to use it. The latest iOS release for Apple TV seems to have fixed this. The Netflix streaming interface on the Apple TV is faster and better than the one on my TiVo box however most of the time I keep my receiver set to TiVo so I tend to watch Netflix more through the TiVo box simply because of the friction of getting the receiver remote and changing the input. It would be nice if the Apple TV would support Amazon's Prime streaming service but I'm not holding my breath on that since Apple has a competing service with the iTunes store. But then again, they do support Netflix so who knows what the future holds. I don't really purchase music or movies from iTunes so streaming purchased content to my Apple TV is not a feature I've used. In summary, the Apple TV is a fairly simple device but it serves a great purpose bringing shows like This Week in Startups, This Week in Venture Capital and TWiT to my living room in a way that's a lot more elegant than hooking an HDMI cable up to my computer. I would like to see the TV iOS platform support apps as I can think of a million that would be great to have on my TV. It doesn't seem like a hard technical challenge to enable that since the underlying operating system supports it on the iPhone and iPad. 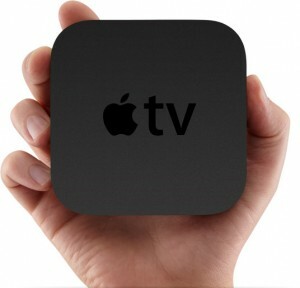 Hopefully Apple will allow iOS TV development this year. And in a perfect world Skype will create an app that allows me to video conference from my television without having to buy a new Blu Ray player. I'm a big fan of Terminator: The Sarah Connor Chronicles on FOX. I didn't start watching the show until earlier this year. But I then bought both seasons one and two from Amazon's on-demand service to catch up. I also bought the first season on DVD and preordered the second season . I like the show. So I was dismayed last night when reading that it's unlikely to return for a third season. Which got me curious about the show's ratings. I used to be fairly informed about the entertainment business. Well television, movies, and music at any rate. I've never known much about the theater. A long time ago I had this idea I wanted to buy a television network (a story for another day). So I set about educating myself on the business. I have been involved in the Second Life community off and on for several years. For a time I was very bullish on the project and I really thought it might take off and realize Neal Stephenson's Metaverse concept. But it doesn't seem that it is going to get there. I thought that if Linden Labs kept innovating they might make progress in that direction, but upon logging in recently I've realized that the whole architecture is flawed. I bought my iPhone as much as anything because I was sick of having RAZRs die on me, and I missed having a smart phone that let me easily access my e-mail on the go. I'm finding that I actually enjoy my iPhone a lot more than I thought I expected. It really is a very useful piece of communications equipment, aside from just the phone and e-mail capabilities. The iTunes App Store really takes the phone to a whole other level. In fact, part of the reason that I decided to get the iPhone was seeing David Pogue's review (video) of the iPhone and App Store. While I think that some of the most useful iPhone applications have yet to be written, there are already several killer apps available. And they're free which is even better. Pandora Radio has an iPhone application that lets you listen to Pandora streaming stations on the iPhone. The sound quality is good and when you are connected via wifi it upgrades to stereo. There is also a free Shazam application. The Shazam service has been around for some time, but I can't say that I've ever used it prior to having an iPhone. Their free application is wonderful and easy to use. It allows you to "tag" music that is playing. You press the "tag now" button and it listens for a few seconds, uploads the sample to their service, and then tells you what song you're listening to as well as linking to the iTunes Music Store to purchase it and a video of the song on YouTube if one exists. It saves the tag history which is great because there are so many times where I'll hear a song on the radio while I'm driving and not be able to remember what it was later. Now I don't have to worry about that any more. Although I am not as active in the social networking scene as I once was, Facebook has a great application for the iPhone. It presents the information feed from the service in a format that is perfect for consumption on the iPhone. It also includes a wonderful interface to viewing photos from the site that is very similar to the photo viewer that's built into the device for viewing local photos. Overall the application has a great interface design. My TiVo informed me today that NBC has made pilots to four of their upcoming fall shows available for free via the TiVo and Amazon Unbox partnership. I have been looking forward to the new Bionic Woman ever since I heard it was picked up. I took the opportunity to watch the commercial free pilot today via TiVo and Amazon Unbox. It didn't disappoint.